Kitchen & Dining. The faux leather is coated with a film of Faux Leather ensuring durability and water resistance, easy to clean and maintain. Padded seat with high back ergonomic design, very comfortable. New listingWooden Dinning room Chairs. Set of 4. Wooden Dinning room Chairs. Set of 4.. Condition is Used. Collection in person only. 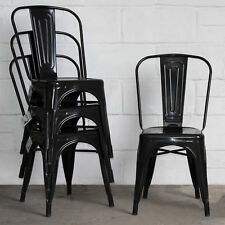 MOF Eiffel Style Dining Chairs Wood Legs & Comfortable Padded Seat UK STOCK!!!! Roma Chair - Steel. Industrial Style. Dark Wood Seat. Seat Height from Floor: 45cm. Seat Width: 37cm. Order in the next. Product Specification Order Alterations. A set of four country style kitchen/dining chairs, well shaped for comfort. Made chiefly from beech wood with attractively grained elm seats. They are ready for chemical dipping, ready for a new finish of danish oil/paint or whatever the new owner might fancy. This fashionable dining side chairs will not go unnoticed with it inspire design and trend colors upholstery. 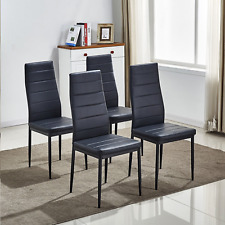 One order=4 chairs. Seat Upholstery: Linen fabric cloth. Color: Grey. A nice soft rubber floor protectors for sensitive flooring. More Color of Velvet Chairs IN Here. One order = 4 Chairs without Table. Marks can be removed with hand or a soft clothes brush, brushing gently in the direction of the nap. Seat Color: Grey. Seat Height: 47 cm. A set of 4 Shabby Chic Kitchen Dining Chairs. Easy to stack - great for storage. Solid 1 piece chair - no assembly required. 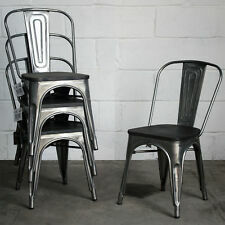 Industrial Style Cafe/bistro Chairs. Seat width: 36cm (front)/30cm (rear). Rubber anti slip feet to protect floors & stop noise. 3 GREY WOODEN DINING CHAIRS GOOD CONDITION FEW MARKS 2 YEARS OLD. Seats currently covered in a neutral fabric but lift out seat pads with hessian style webbing to underside so easy to re-cover if required. 4 leather kitchen/dining chairs. All 4 chairs in a good condition. There are small usage marks. OKA CAMARGUE SOLID OAK DINING CHAIRS, WEATHERED OAK, FABULOUS CONDITION!!! "In peerless Oak, this version of our perennial popular Camargue chair is a classic. Smart enough for the dining room, but equally fabulous around a kitchen table or at a desk.". 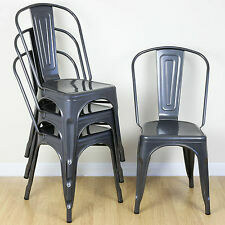 A retro set of ladder back kitchen dining chairs. Made by Schreiber in the mid century with mix and match vinyl black and beige seat covers, all of which are in good order. The front legs are circular 'pin' design. 4 Wooden Farmhouse kitchen/Dining Chairs. 4 country farmhouse style chairs. Good solid chairs with a few light marks from use. Condition is Used. These chairs have been in storage for several years. A few of the joints are loose (glued joints) and one of the seat bases has a crack in it. The have been lacquered or varnished; this is now crazed.